Together with the Asia Society and Natural Resources Defense Council (NRDC), the Goldman Prize hosted an event last night featuring a presentation by 2012 Goldman Prize winner Ma Jun followed by a Q&A with the audience. Earlier in the day, Ma also stopped by the Goldman Prize office for a luncheon where local NGOs and potential donors had the opportunity to hear about Ma’s work in a more intimate setting. 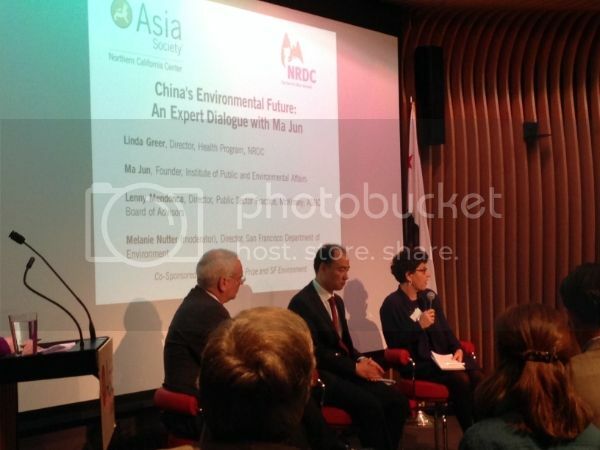 At the evening event, Ma was joined by Linda Greer of NRDC and Lenny Mendonca of McKinsey. Melanie Nutter of San Francisco’s Department of Environment acted as moderator of the discussion. Ma was awarded the Prize in 2012 for exposing over 90,000 air and water violations by local and multinational companies operating in China. Using an online database and digital map to show which factories were polluting the most, Ma and his team at Institute for Public and Environmental Affairs (IPE) were able to pressure companies to clean up their supply chains and empower local citizens to demand justice. Since winning the Prize, Ma’s work has expanded steadily. IPE is now reporting emissions data from 114 cities across all Chinese provinces. Real-time air and water quality data have enabled the implementation of emergency response measures, such as canceling outdoor activities, when air quality becomes hazardous. Ma Jun (center) on stage with Linda Greer (right) and Lenny Mendonca (left). Ma continues to call for greater government transparency and public disclosure of emissions data. Accurate and comprehensive data is essential to IPE’s work, as it provides the necessary leverage to pressure companies to adhere to environmental regulations. Ma is also calling on the public to help collect data. IPE recently launched an innovative “take a picture to locate a polluter” campaign, which encourages citizens to snap cell phone photos of environmental violations they come across and upload them to the web.